American engineer mission specialist astronaut 1994-2010. US Navy aviator; first woman assigned to a combat aircrew. Status: Inactive; Active 1994-2010. Born: 1959-08-26. Spaceflights: 2 . Total time in space: 29.66 days. Birth Place: Mobile, Alabama. PERSONAL DATA: Born in Mobile, Alabama, Hire also considers Merritt Island, Florida a hometown. She enjoys sailing, fishing, scuba diving, and snow skiing. EDUCATION: Murphy High School, Mobile, Alabama, 1977. Bachelor of Science, U.S. Naval Academy, 1981. Master of Science, Florida Institute of Technology, 1991. ORGANIZATIONS: Association of Space Explorers, Association of Naval Aviation, U.S. Naval Academy Alumni Association, U.S. Sailing Association. EXPERIENCE: Commissioned as a Naval Officer in 1981, Hire earned her Naval Flight Officer Wings in 1982. She flew worldwide oceanographic research missions to 25 countries aboard specially configured P-3 Orion aircraft with Oceanographic Development Squadron Eight (VXN-8). She later taught airborne navigation for three years to over 600 student naval flight officers. In 1989, Hire left full time naval ranks and began parallel but separate civilian and military careers as a Space Shuttle Engineer and as a Navy Reserve Officer. On May 13, 1993, Hire, became the first female in the U. S. military to be assigned to a combat aircrew, when she reported to Patrol Squadron Sixty-Two (VP-62). Flying aboard the P-3 maritime patrol aircraft, she participated in Atlantic and Caribbean operations. Hire continued her Navy Reserve duty with various units based in Florida, Louisiana, and Texas. She was recalled to active naval duty supporting Operation Enduring Freedom and Operation Iraqi Freedom as a member of U .S. Naval Central Command staff. Hire later resumed part-time reserve status and served as Commanding Officer of Space and Naval Warfare Systems Command (SPAWAR) Unit 1010. She is currently the Commanding Officer of the Office of Naval Research/ Naval Research Lab (ONR/NRL) Unit 113, supporting projects at the Naval Post Graduate School, Monterey, California. NASA EXPERIENCE: Hire started at NASA’s Kennedy Space Center (KSC) in 1989 as an engineer for Lockheed Space Operations Company. 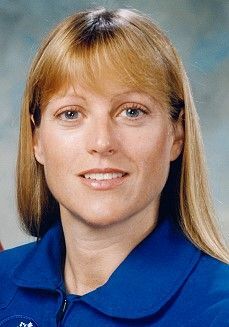 She worked as a Space Shuttle Orbiter Mechanical Systems Engineer, then Test Project Engineer, and eventually Supervisor of Space Shuttle Orbiter Mechanical Systems and Launch Pad Access Swing Arms. During her six years at KSC, she processed Space Shuttles from landing through ground preparations and launch countdowns for over 40 missions. Hire reported to the Johnson Space Center for Astronaut training in March 1995. She has worked in mission control as a spacecraft communicator (CAPCOM), and served as the Astronaut Office Lead for Shuttle Avionics Integration Laboratory (SAIL), Shuttle Payloads, and Flight Crew Equipment. She currently serves on the Astronaut Support Personnel (ASP) team, traveling to Florida in support of crew launch and landing operations conducted at the Kennedy Space Center. Hire flew on Space Shuttle missions STS-90 (1998) and STS-130 (2010). She has logged over 711 hours in space. SPACE FLIGHT EXPERIENCE: STS-90 Neurolab (April 17 – May 3, 1998). Hire flew as Mission Specialist 2, the flight engineer during the 16-day Spacelab flight. The seven-member crew aboard Space Shuttle Columbia served as both experiment subjects and operators for 26 life science experiments focused on the effects of microgravity on the brain and central nervous system. The STS-90 crew orbited the Earth 256 times, and covered 6.3 million miles. STS-130 (February 08–21, 2010). Space Shuttle Endeavour launched and landed at night on the thirty-second mission to assemble the International Space Station. The STS-130 crew delivered and outfitted Node 3, also known as Tranquility, and the Cupola, a seven-windowed portal for the space station. As Mission Specialist 1, Hire operated the robotic arms, led the transfer of 4500 pounds of cargo, and helped install water recycling, air cleaning and cooling, and crew exercise equipment in Node 3 and Cupola. During the 2-week mission, Endeavour and crew travelled over 5.7 million miles and completed 217 orbits of the earth. Born August 26, 1959, in Mobile, Alabama. She enjoys competitive sailing, snow skiing, scuba diving, and fishing. Graduated from Murphy High School, Mobile, Alabama, in 1977. Bachelor of science degree in engineering and management from the U.S. Naval Academy, 1981. Master of science degree in space technology from Florida Institute of Technology, 1991. Association of Naval Aviation, American Institute of Aeronautics and Astronautics, Institute of Navigation, Society of Women Engineers, U.S. Sailing Association. National Defense Service Medal, Coast Guard Special Operations Service Ribbon, Navy and Marine Corps Overseas Service ribbon, Space Coast Society of Women Engineers Distinguished New Woman Engineer for 1993. After earning her Naval Flight Officer Wings in October 1982, Hire conducted worldwide airborne oceanographic research missions with Oceanographic Development Squadron Eight (VXN-8) based at NAS Patuxent River, Maryland. She worked as Oceanographic Project Coordinator, Mission Commander and Detachment Officer-in-Charge on board the specially configured P-3 aircraft. Hire instructed student naval flight officers in the classroom, simulator, and on board the T-43 aircraft at the Naval Air Training Unit on Mather Air Force Base, California. She progressed from Navigation Instructor through Course Manager to Curriculum Manager and was awarded the Air Force Master of Flying Instruction. In January 1989, Hire joined the Naval Air Reserve at NAS Jacksonville, Florida. Her tours of duty included Squadron Augment Unit VP-0545 and Anti-submarine Warfare Operations Center 0574 and 0374. Hire became the first female in the United States assigned to a combat aircrew when she reported to Patrol Squadron Sixty-Two (VP-62) on May 13, 1993. As a Patrol Plane Navigator/Communicator she deployed to Iceland, Puerto Rico and Panama. Hire later served at NAS Joint Reserve Base New Orleans with CV-63 USS Kittyhawk 0482 and Tactical Support Center 0682. Presently she is a member of the Naval Reserve, Commander Seventh Fleet Detachment 111 at Naval Air Station Dallas, Texas. Hire began work at the Kennedy Space Center in May 1989, first as an Orbiter Processing Facility 3 Activation Engineer with EG&G and later as a Space Shuttle Orbiter Mechanical Systems Engineer for Lockheed Space Operations Company. In 1991 she certified as a Space Shuttle Test Project Engineer (TPE). From the TPE computer console position in the Launch Control Center, she integrated all technical aspects of Space Shuttle turnaround maintenance from landing through next launch. Additionally, she headed the checkout of the Extravehicular Mobility Units (spacesuits) and Russian Orbiter Docking System. Hire was assigned Supervisor of Space Shuttle Orbiter Mechanisms and Launch Pad Swing Arms in 1994. Selected by NASA in December 1994, Hire reported to the Johnson Space Center in March 1995, and completed a year of training and evaluation. She has worked in mission control as a spacecraft communicator (CAPCOM) since April 1996. Assigned to STS-90, Hire will be Mission Specialist 2 on the 16 day mission scheduled for launch in Spring 1998. Family: Astronaut. Country: USA. Spacecraft: ISS. Flights: STS-90, STS-130. Projects: STS. Agency: USN. Bibliography: 12, 5522. 1959 August 26 - . Birth of Kathryn Patricia 'Kay' Hire - . Nation: USA. Related Persons: Hire. American engineer mission specialist astronaut 1994-2010. US Navy aviator; first woman assigned to a combat aircrew. 2 spaceflights, 29.7 days in space. Flew to orbit on STS-90 (1998), STS-130..
2010 February 8 - . 09:14 GMT - . Launch Site: Cape Canaveral. Launch Complex: Cape Canaveral LC39A. LV Family: Shuttle. Launch Vehicle: Space Shuttle. STS-130 - . Call Sign: Endeavour. Crew: Behnken, Hire, Patrick, Robinson, Virts, Zamka. Payload: Endeavour F24 / Tranquility / Cupola. Mass: 121,320 kg (267,460 lb). Nation: USA. Related Persons: Behnken, Hire, Patrick, Robinson, Virts, Zamka. Agency: NASA. Program: ISS. Class: Manned. Type: Manned spaceplane. Flight: Soyuz TMA-16, Soyuz TMA-17, STS-130. Spacecraft Bus: Shuttle. Spacecraft: Endeavour. Duration: 13.75 days. Decay Date: 2010-02-22 03:20:00 . USAF Sat Cat: 36394 . COSPAR: 2010-004A. Apogee: 348 km (216 mi). Perigee: 334 km (207 mi). Inclination: 51.60 deg. Period: 91.40 min. Docked with the ISS at 05:06 GMT on 10 February. Primary payloads were the Tranquility module and the Cupola, a robotic control station with six windows around its sides and another in the center, providing a 360-degree view around the station..